A question was posted to the newsgroups recently that reminded me that I had also run into the same situation previously. I was trying to drag a shortcut into a folder that I had also created and it wouldn't drag & drop for me in my Dynamics GP 10.0. I went back to 9.0 and had no issue doing this but it just wouldn't work in 10.0. After playing with it a bit I saw what was happening and the way around it. Superb and very useful post by Jivtesh on the GP 10 Short cut keys. Recently, while working on a personal project, I realized that after more than 1 year of working with Dynamics GP 10.0 I had no idea why my toolbar menu items and menu drop-downs did not show the shortcut characters - the characters with an underline. 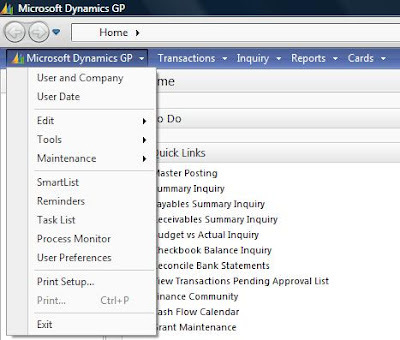 MS has a new article on Customersource with keyboard shortcuts for Dynamics GP 9.0 here.